I recently found another photo of the mysterious Ushi Nagar pointe shoe model and still have as many questions about this brand as I did in my previous post about them. It appears that Ushi Nagar may still be in business. The nice part about this photo is that a telephone number from the England area can be seen imprinted on the insole of the shoe. I must say that this is a unique place to stamp a business telephone number. Unfortunately, this is a little too long distance for me to call from the states. This is a very fascinating shoe and an equally fascinating maker. Whoever Ushi Nagar is, he has managed to hide himself away from the U.S. market quite nicely. I am looking forward to the day when I can learn more about this maker and exactly where he makes his pointe shoes. 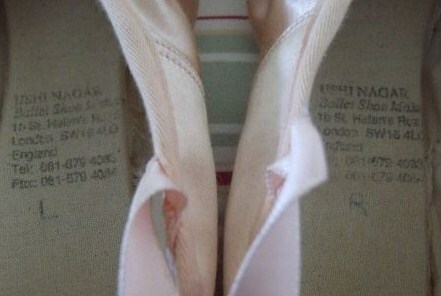 This entry was posted in Mystery Pointe Shoe Brands and tagged Ushi Nagar, Ushi Nagar pointe shoes. Bookmark the permalink.